Difference between revisions of "Railroads"
| caption = Covered railroad bridge, probably in south central Ohio, ca. 1880-1890. As early as the mid 1820s, Ohio residents advocated the building of railroads to speed travel time and to make it easier to ship products. Most Ohioans initially in favor of railroads lived in communities without access to canals. In 1826, a resident of Sandusky encouraged his neighbors to help finance a railroad that would connect their town with Dayton, thus providing Sandusky's residents access to the Miami and Erie Canal. Most early railroads served two purposes. First, most Ohioans wanted railroads to connect communities that did not have access to canals with these types of waterways. Second, most Ohio canals connected Lake Erie with the Ohio River, providing Ohioans with a relatively cheap means of transporting people and products from the northern part to the southern part of the state and vice versa. Many Ohioans hoped that the railroads would provide a quicker means of travel from eastern to western Ohio. While railroad supporters first appeared in Ohio during the mid 1820s, little construction occurred until the 1840s. As of 1840, railroad companies had constructed only forty miles of track in the state, although several companies were currently in existence. Two reasons existed for the slow growth of railroads in Ohio. First, canals provided a cheap means to transport products. Second, the Panic of 1837 had caused many Ohioans to watch their money more closely. Many people deemed railroads as risky, and some investors feared that they could lose their investment in railroad companies. As the United States and Ohio emerged from this economic downturn, investment in railroads quickly grew. By 1850, the Ohio legislature had chartered seventy-six railroad companies. Many of these companies never built any track, but others provided Ohio residents with an improved transportation infrastructure. The first railroad completed in Ohio was the Erie &amp; Kalamazoo Rail Road. The railroad eventually connected Toledo, Ohio, with Adrian, Michigan, a distance of thirty-three miles. Construction began in 1835 and was completed in 1836. The trip between the two communities took three hours. The Little Miami Railroad was one of Ohio's most important early railroads. It was only the second railroad built in Ohio. The state legislature granted the Little Miami Railroad Company a charter in March 1836. The purpose was to connect the city of Cincinnati to Springfield. Construction on the line occurred between 1837 and 1848. The company financed the railroad's construction through pledges from both the state government and local governments. Linkages to other railroads in the years preceding the American Civil War established a network that linked most of Ohio. Construction of the Cincinnati, Hamilton, and Dayton Railroad (CH &amp; D) began in 1851. The railroad attracted German and Irish immigrants who were looking for work. After the railroad was completed, these immigrants stayed in the region and found work in factories that began to emerge near the railroad and the Miami and Erie Canal. In its early years, the railroad line had the nickname "Charge High and Damn Rough Ride. " Unlike the Little Miami Railroad, the CH &amp; D's main purpose was as a commuter line. A number of new communities were built along the rail line, and wealthy people moved out of the city of Cincinnati to live in these communities. Railroads allowed people who could afford to pay the fare to live further away from where they worked. The city of Cincinnati also provided financial support for the construction of the Ohio and Mississippi Railroad in 1854. In Ohio, the railroad ran along the old canal path of the Cincinnati and Whitewater Canal. The Ohio and Mississippi eventually connected Ohio with St. Louis. This railroad provided Ohioans with a quicker means to transport goods and at cheaper rates to the West. The people of Cincinnati hoped that the new railroad would encourage economic growth in the region. Practically all of Ohio's first railroads existed only within the confines of the state or only extended a short distance into neighboring states. The first railroad that truly began to connect Ohio with the rest of the nation was the Baltimore and Ohio Railroad, which reached Ohio in the mid 1850s. The Baltimore and Ohio was the first railroad to cross the Appalachian Mountians into Ohio, providing Ohioans with much quicker access to eastern states. To help assist with railroad construction, the Ohio legislature passed the Ohio Loan Law of 1837. The Ohio Loan Law was designed to assist the building of additional canals within the state. It allowed the Ohio government to loan businesses one-third of the total costs to complete a project. The only requirement was that the business had to have raised two-thirds of the estimated cost before the state government would authorize a loan for the other one-third. Although the Loan Law was created to expand Ohio's canal system, in reality this legislation did more harm than good to the canals. Most of the loans granted by the Ohio legislature went to railroad companies, rather than to the canals. The Ohio Loan Law spurred railroad growth in the state. Canals now faced opposition from the railroads, and they quickly lost business to the faster railroad. Following the American Civil War, Ohio experienced tremendous growth in railroad mileage. Larger, multi-state railroad companies also began to purchase shorter lines in Ohio and connected them together, making a more integrated railroad system. For example, in 1870, the Little Miami Railroad leased most of its line to the Pennsylvania Railroad system as part of a ninety-nine-year agreement. This lease was renewed once again in 1968. The CH &amp; D Railroad and the Ohio and Mississippi Railroad eventually became part of the Baltimore and Ohio Railroad. By 1900, most of Ohio's smaller railroads now belonged to one of four major railroad companies, the Baltimore and Ohio Railroad, the Erie Railroad, the Pennsylvania Railroad, or the New York Central Railroad. By 1910, more than 9,500 miles of track operated within Ohio, up from 8,900 miles just ten years earlier. Railroad companies built much of the new track in northeastern Ohio to help facilitate the major industries in cities like Akron, Canton, Cleveland, and Youngstown. Railroads dominated Ohio's transportation infrastructure until after World War II, when the trucking industry experienced tremendous growth and took away much of the railroads' business. Automobiles also became more accessible for the American people, taking large numbers of railroad passengers off of the trains. Passenger airplanes, much faster than the railroads, also removed people from the trains. Since World War II, many railroad company's have cut back service in Ohio. Many railroad companies have sold their tracks to various municipalities. Cities such as Cincinnati and Newark have converted these former railroad tracks into bike paths and walking trails. This holds true for the Little Miami Railroad. The last trains stopped running in the 1970s on most of this line. There is a small portion of track still in use in Cincinnati, but the rest of the line was retired. The city incorporated the railroad right-of-way into a recreational bike path known as the Little Miami Scenic Trail, which is more than seventy miles long. Covered railroad bridge, probably in south central Ohio, ca. 1880-1890. As early as the mid-1820s, Ohio residents advocated the building of railroads to make traveling easier and to make it easier to ship products. Most Ohioans initially in favor of railroads lived in communities without access to canals. In 1826, a resident of Sandusky encouraged his neighbors to help finance a railroad that would connect their town with Dayton, thus providing Sandusky's residents access to the Miami and Erie Canal. Most early railroads served two purposes. First, most Ohioans wanted railroads to connect communities that did not have access to canals. Second, most Ohio canals connected Lake Erie with the Ohio River, providing Ohioans with a relatively cheap means of transporting people and products from the northern part to the southern part of the state and vice versa. Many Ohioans hoped that the railroads would provide a quicker means of travel from eastern to western Ohio. While railroad supporters first appeared in Ohio during the mid-1820s, little construction occurred until the 1840s. As of 1840, railroad companies had constructed only forty miles of track in the state, although several companies were currently in existence. Two reasons existed for the slow growth of railroads in Ohio. First, canals provided a cheap means to transport products. Second, the Panic of 1837 had caused many Ohioans to avoid spending their money. Many people deemed railroads as risky, and some investors feared that they could lose their investment in railroad companies. As the United States and Ohio emerged from this economic downturn, investment in railroads quickly grew. By 1850, the Ohio legislature had chartered seventy-six railroad companies. Many of these companies never built any track, but others provided Ohio residents with an improved transportation infrastructure. The first railroad completed in Ohio was the Erie & Kalamazoo Rail Road. The railroad eventually connected Toledo, Ohio, with Adrian, Michigan, a distance of thirty-three miles. Construction began in 1835 and was completed in 1836. The trip between the two communities took three hours. The Little Miami Railroad was one of Ohio's most important early railroads. It was only the second railroad built in Ohio. The state legislature granted the Little Miami Railroad Company a charter in March 1836. The purpose was to connect the city of Cincinnati to Springfield. Construction on the line occurred between 1837 and 1848. The company financed the railroad's construction through money from both the state government and local governments. Linkages to other railroads in the years preceding the American Civil War established a network that linked most of Ohio. Construction of the Cincinnati, Hamilton, and Dayton Railroad (CH & D) began in 1851. The railroad attracted German and Irish immigrants who were looking for work. After the railroad was completed, these immigrants stayed in the region and found work in factories that began to emerge near the railroad and the Miami and Erie Canal. In its early years, the railroad line had the nickname "Charge High and Damn Rough Ride. " Unlike the Little Miami Railroad, the CH & D's main purpose was transporting passengers. A number of new communities were built along the rail line, and wealthy people moved out of the city of Cincinnati to live in these communities. Railroads allowed people who could afford to pay the fare to live further away from where they worked. Practically all of Ohio's first railroads existed only within the confines of the state or only extended a short distance into neighboring states. The first railroad that truly began to connect Ohio with the rest of the nation was the Baltimore and Ohio Railroad, which reached Ohio in the mid-1850s. The Baltimore and Ohio was the first railroad to cross the Appalachian Mountains into Ohio, providing Ohioans with much quicker access to eastern states. Following the American Civil War, Ohio experienced tremendous growth in railroad mileage. 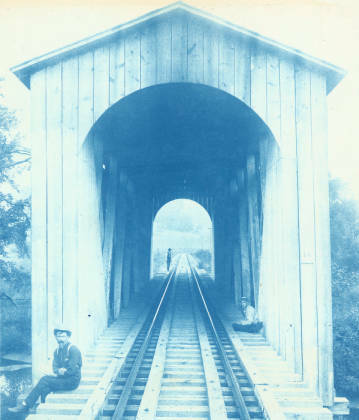 Larger railroad companies also began to purchase shorter lines in Ohio and connected them together, making a more integrated railroad system. For example, in 1870, the Little Miami Railroad leased most of its line to the Pennsylvania Railroad system as part of a ninety-nine year agreement. This lease was renewed once again in 1968. The CH & D Railroad and the Ohio and Mississippi Railroad eventually became part of the Baltimore and Ohio Railroad. By 1900, most of Ohio's smaller railroads now belonged to one of four major railroad companies, the Baltimore and Ohio Railroad, the Erie Railroad, the Pennsylvania Railroad, or the New York Central Railroad. By 1910, more than 9,500 miles of track was used within Ohio, up from 8,900 miles just ten years earlier. Railroad companies built much of the new track in northeastern Ohio to help facilitate the major industries in cities like Akron, Canton, Cleveland, and Youngstown. Railroads dominated Ohio's transportation infrastructure until after World War II, when the trucking industry experienced tremendous growth and took away much of the railroads' business. Automobiles also became more accessible for the American people, taking large numbers of railroad passengers off of the trains. Passenger airplanes, much faster than the railroads, also removed people from the trains. Since World War II, many railroad company's have cut back service in Ohio. Many railroad companies have sold their tracks to various municipalities. Cities such as Cincinnati and Newark have converted these former railroad tracks into bike paths and walking trails. This holds true for the Little Miami Railroad. The last trains stopped running in the 1970s on most of this line. There is a small portion of track still in use in Cincinnati, but the rest of the line was retired. The city incorporated the railroad into a recreational bike path known as the Little Miami Scenic Trail, which is more than seventy miles long.